Rehana was a young student of FSc. in 1999 when she first started experiencing symptoms of Multiple Sclerosis (MS). 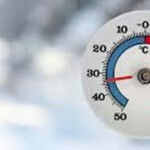 Initially, the symptoms included mild numbness and weakness in the legs after waking up in the mornings. When these symptoms aggravated to the point that she started experiencing difficulty walking, Rehana decided to seek medical help. Initially, the doctors prescribed medication and injections aimed only to treat the weakness. However, Rehana’s condition progressed from general weakness to the point where she lost feeling and sensation in her lower limbs. It became almost impossible for her to walk and she had to be helped physically by her family members to visit the hospital. Rehana’s father had passed away a few years before and as the youngest child, continued visits to the hospital added to the financial and emotional burdens of the family. It was at this time that Rehana was initially admitted in the ward of a neurosurgeon who diagnosed her with paraparesis (paraplegia) or partial paralysis of the lower limbs. For this, she was administered steroids which provided temporary relief. For further treatment of her symptoms, Rehana was referred to hospitals in Lahore but due to the tight financial situation of the family, she could not travel to Lahore for treatment. Soon, Rehana was discharged from the hospital and after coming back home, she suffered another severe relapse that caused her to lose control over her limbs. Eventually Rehana was officially diagnosed with Multiple Sclerosis by a local doctor who prescribed her Deltacortene / Prednisone. 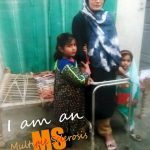 However, added to Rehana’s frustrations was the fact that she did not understand what MS meant, how the disease progressed and what was the proper medical treatment for this disease. Because of this lack of guidance, Rehana was also unable to make the lifestyle changes or get proper medical treatment that could have prevented the symptoms from progressing to an advanced stage. After the initial treatment of Deltacortril, Rehana started to recover somewhat. However, in the year 2000, she suffered another relapse which affected her right eye. 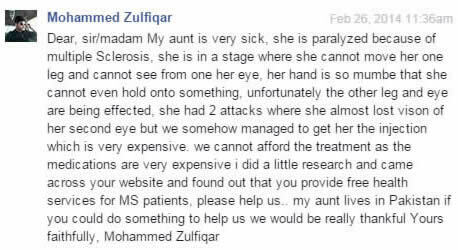 As a result of this, she started experiencing blurring in her right eye. Multiple visits to the eye specialist could not pinpoint the problem and because the prescribed medicine Solu-Medrol was not taken immediately after the relapse, Rehana lost complete vision of her right eye. To add to all this, at this point Rehana also lost her mother and her financial and social problems increased her restriction to her house. Battling a disease that she understood very little about and constrained by her family’s finances, Rehana also suffered from the psychological burdens associated with the disease. Despite the fact that Rehana’s physical mobility was restricted, she was able to complete her education privately from AIOU (Allama Iqbal Open University). Still she continued suffering from relapses including those of her left eye. During the relapses, she suffered from extreme pain in the back, stomach and waist. She also experienced total numbness waist down and had constant numbness and pins and needles in both hands. Eventually, Rehana got married in 2007 and shortly afterwards had her first child. While her pregnancy was normal, she suffered a relapse immediately after her daughter was born. Over the years, as Rehana settled into a new life of taking up responsibilities of her own family, she was also increasingly burdened by the social stigma of living with MS. Not only was her physical mobility significantly limited and visits to the doctor became harder, but the lack of support from her relatives was a cause of constant emotional burden for her. Due to these reasons, her relapses and attacks become more frequent. 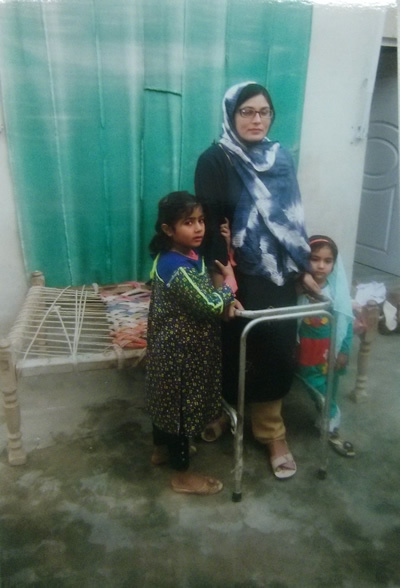 Eventually, in 2014, Rehana and her husband were able to connect over the internet with the Society for Multiple Sclerosis Patients in Pakistan. Through the society, they were able to understand exactly what Multiple Sclerosis is, how the disease impacts the body and what sort of medical treatments and lifestyle changes should be adopted to keep the relapses under control. 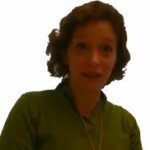 In addition to that, the Society informed Rehana of the diet that MS patients need to follow, gave tips for living with Multiple Sclerosis as well as educating her about the impact of weather, sleep patterns, stress and anxiety on her MS symptoms. The Society has also been able to help her access the medicines she needs to take on a regular basis to decrease the frequency of relapses. Today, Rehana is living with her husband and 4 lovely and healthy children. Her husband, Muhammad Arshad, is very supportive, and takes really good care of her. However, with a monthly income of only Rs. 20,000 and 4 kids to take care of, and with Rehana’s illness, it was impossible for him to make ends meet. "Life is too short to waste. If you need to do something, don’t wait and don’t let MS drag you down. Stay focused and determined and achieve your goals in life before it is too late." How Rehana contacted the Society? Rehana first contacted the Society in February 2014 with the help of her nephew who had internet availability. They found out about the Society through our website and Facebook page when Rehana’s condition had worsened beyond limits and life had become almost impossible for her. Rehana contacted the Society in a very desperate state, asking for help and support. She was diagnosed with MS 15 years ago and her condition had worsened over the years due to lack of proper health care facilities in her area, financial constraints and lack of awareness about the disease. Some of the messages she sent to the Society were totally heart wrenching. She had completely lost hope and she was in a very depressed state of mind. Since she was taking steroids on a regular basis, they had stopped affecting her condition over time. She was also suffering from chronic depression because of her hopeless state. The Society acted quickly to help and support her. We provided her with the medications she needed which she and her family were not being able to afford. We also referred her to good doctors and sent her an MS diet plan, an exercise plan and guided her regularly on how she could take care of herself. With constant guidance, Rehana’s condition improved significantly and by mid April 2014, she was feeling much better. 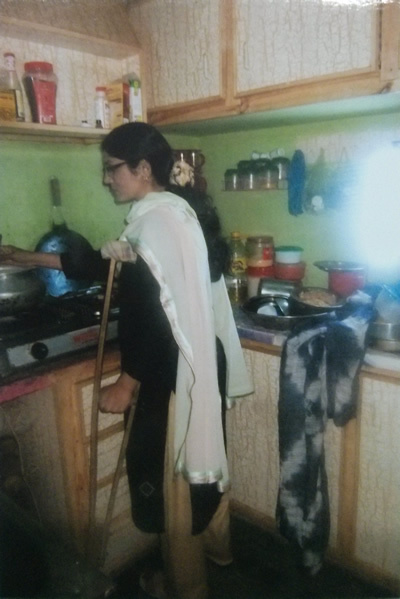 With our help, Rehana has also started physiotherapy rehabilitation which is helping her a lot. We are also taking care of Rehana’s medications which are sent to her every month. 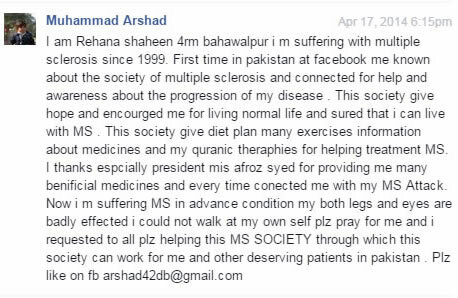 The Society is working with so many other MS patients from all over Pakistan and wants to help more patients. This can only be possible with your continued donations and support. Due to lack of funds, we have refused medical assistance to quite a few deserving cases. You can Donate to our Society to help patients like Rehana and give them hope and a better chance to live life. ← Can high salt intake affect your MS?